Thirty-five year old Marsha Reece stood in the Georgetown magistrates’ court before chief magistrate Ann McLennan where an indictable drug trafficking charge was read to her. The charge alleges that on May 4, 2017 in Linden, she had in her possession 197.6 grammes of cocaine in her possession for the purpose of trafficking. Defense Counsel ,Adrian Thompson, in a bail application, told the court that police arrested his client along with seven others but only his client was brought to court. Thompson added that the cocaine was not found on his client as such requested bail in a reasonable for his client. On the other hand, Police Prosecutor Alwyn Moore objected to bail being granted based on the fact that not enough special reason was given for bail to be granted, Moore added also that on the day in question, ranks were conducting a raid in the Victory Valley area when the defendant was seen running through a back door with a bulky black bag. Police gave chase and Reece dropped the bag ,which was then retrieved by police, and the suspected drug was found in the form of rocks. When shown the alleged drug, Reece under cautioned told police that it was hers and she would normally sell the cocaine. 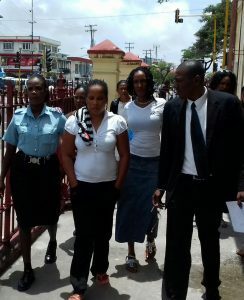 Taking all of the circumstances into consideration, Chief Magistrate McLennan remanded Marsha Reece tp prison until May 17, 2017 and her matter was transferred to the Linden Magistrates’ Court.